was published on the 25th of June 1947. Your Challenge is to create a poem from an entry in a journal, yours or someone else's. You might also want to reflect on the writer or on the journal. Or write a poem as if it is a journal entry. 1. Post your diary story poem on your site, and then link it here. 4. Honor our community by visiting and commenting on others' poems. (Saying that sometimes makes me flash on Robin Williams.) Thank you, Brian, for permission to use your wonderful poem. Have a great day. Yes, all that and more, Jae Rose! Welcome to Midweek. Have a great day. Excellent prompt, Susan; and what a pleasure to see Brian's poem here as well. Looking forward to seeing what others come up with for this prompt. I hoped his poem would surprise you! It's a natural, isn't it? BTW, help desk may have ironed out the kinks in the link. You are very welcome Maniparna. Enjoy the day. Good to see you here! Grin. Thank you Grace! He does fit here well, and right next to Leonard. Time to go to Physical therapy. I will be back! Wow! I am moved by your poems and look forward to the rest. Brian a colorful look at the "armchair" athlete. I am watching the world cup and playing vicariously through the players. I am so glad that they can not--though it might be interesting if they talked to me alone--more like a sister than like a burning bush! Great prompt, Susan! I am enjoying what others have written. Me, too. It seems time to pause and think about how we remember and/or use these catch-alls. Susan what a nostalgic theme... I used to have so many diaries started at different phases of life and then discontinued at some point... thank you!! This makes me wonder/warn: "Do you know where your diaries are?" Perhaps at some point, only the poems and publications should survive. 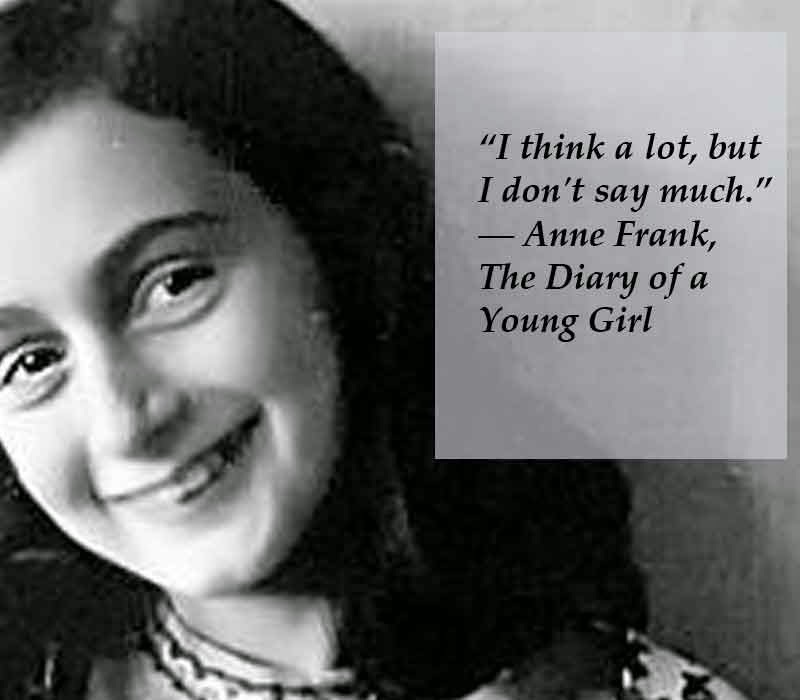 Perhaps, like Anne Franks, it is good when they speak. Thank you, Arushi! I have an invite to dinner, Poets, so I'm taking a train from this odd little suburb and heading to downtown Philly hoping the storm won't be too horrible. Indian food, a birthday treat. No--it is not my birthday--just an early gift from friend and FUN. I'll check in again before bed-time. Enjoy. you had me about to sing happy birthday as well...smiles. Aw ... go ahead Brian! Hope you had a delightful dinner. I like that you used two of my favorite poets as examples for your great prompt. I'm submitting mine. It's a little late, but I'm happy to join in. I'm open until Saturday, Myrna! Glad you could make it. p.s. Brian, I LOVE seeing your poem there for inspiration!! Amazing action in your poem, Sherry! Collected my story a stanza by stanza, day by day....Thanks for inspiration, Susan! re very welcome, Humbird. Good to see you here. Good day, I've posted a journal entry about a 1967 C-10 Chevrolet Pick Up I owned, please enjoy!! Nice. Please visit the rest of us! You are very welcome, Loredana. Happy Friday, Poets United! Poets can join in today and tomorrow too, so if you meet up with a poem and poet that fit the diary motif and would enjoy joining us, give them the link. I have been moved and inspired by this week's poems here and elsewhere. What a week! Susan, this is a wonderful prompt..I enjoyed it very much.Thank You..smiles..
Nice one by Leonard Cohen. Love this prompt.